Joe Abercrombie is one of the finest fantasy authors currently writing. He is at the forefront of a current trend in fantasy to write gritty, cynical novels that take place in a world of grays as opposed to the traditional black and white. In his novels you will not find a farm-boy meeting his destiny as world-savior. You will not find noble knights, or even much nobility at all. What you will find is conflicted characters, highly flawed but well meaning individuals, and outright scum. As opposed to the typical black/white morality of typical epic fantasy, Abercrombie's world is grey leaning towards black. 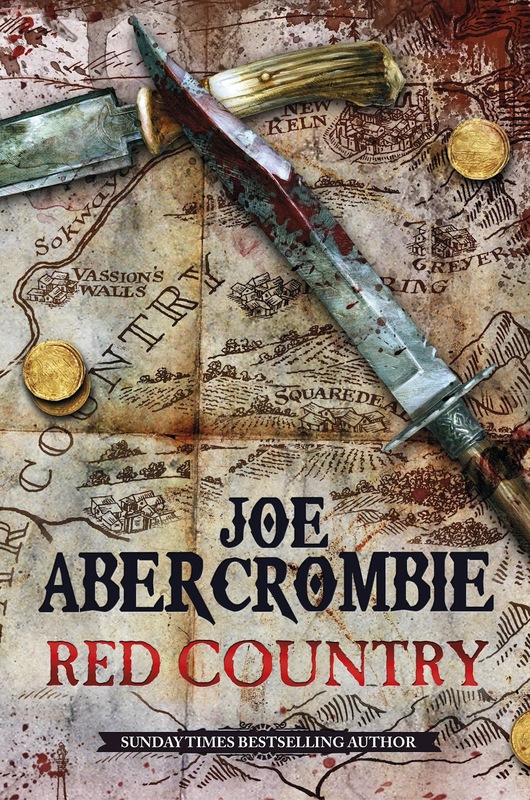 With that being said, Abercrombie has managed to find success, and has so far provided readers with his First Law trilogy (The Blade Itself, Before They Are Hanged, and The Last Argument of Kings), followed by three stand-alone novels (Best Served Cold, The Heroes, and Red Country) all set in the same world and even featuring some of the same characters. I discovered him in late 2010, when I read his short story “The Fool Jobs” featured in Swords & Dark Magic, a sword and sorcery anthology released that summer. It was short, featured an interesting motley of characters, and had some of the best written action I've ever read. It left me hungering for more, and right before The Heroes was published in February 2011, I sat down and read straight through all of his books, unable to put them down. "They burned her home. They stole her brother and sister. But vengeance is following. Their journey will take them across the barren plains to a frontier town gripped by gold fever, through feud, duel and massacre, high into the unmapped mountains to a reckoning with the Ghosts. 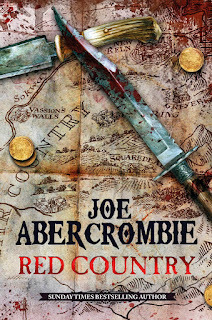 Even worse, it will force them into alliance with Nicomo Cosca, infamous soldier of fortune, and his feckless lawyer Temple, two men no one should ever have to trust…"
Fans of Joe Abercrombie will find much to like here. The title perfectly describes the setting, a lawless frontier where violence is commonplace. Violence means that Abercrombie's smoothly written action scenes will abound. The sharp and witty dialogue he is known for writing is also pasted on every page, this time delivered with a Western twang. The characters are all quite interesting as well. Several characters from previous novels appear, some better and some worse off than before. 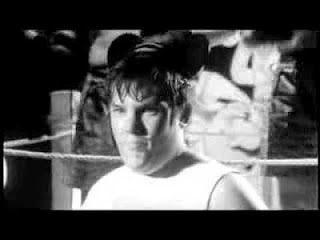 Nicomo Cosca manages to be the scene-stealer he always was, although his character is definitely at a low point, and at times not nearly as likeable as before. It is apparent that with age he has only sunken lower towards the selfish, mercenary scum he can be. Logen makes his long-awaited return and seems very much like an older version of the Logen readers fell in love with: a man trying to escape from his violent past. The theft of the kids forces Logen to abandon the life he has previously been living, and revert back to the Logen of the past. Although not a POV character, Logen remains as interesting a character as before, and is a perfect picture of a man at conflict with himself. His return is everything it should be. Eyes should be kept open for several other cameos throughout the novel. The new characters are also wonderfully written. Shy South is a leather-tough younger woman with a past she is ashamed of. She is willing to do whatever it takes to recover her siblings, although she takes no joy in any of the violence, revenge not being as important as the recovery of the children. 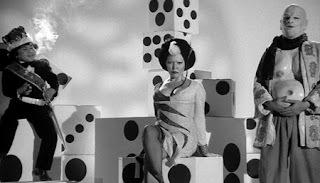 She is very likeable, and despite the shady past she seems to mostly be cut from good cloth. Temple starts as Cosca's lawyer, and is perhaps the most interesting of the new characters. He is yet another character with a shameful past, but his past is mostly regrets as opposed to the violent past of many of the other characters. He has a low opinion of himself, a quick wit, and seems to always take the easy way, although as of late his conscience seems to bother him. He wants to do right, but is not confident in himself enough. He is the one who truly finds himself on the journey across the Far Country. Also of note is a mysterious man they travel with, named Savian. His description as a grizzled, wiry-older man with squinty eyes, a calm and quiet demeanor, and a rough voice all point towards this character being Clint Eastwood himself making a cameo. As for the mash-up, a lot of fans were wondering what to expect from a fantasy-western. 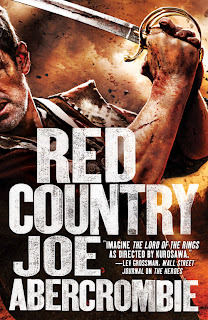 Red Country definitely is more akin to a Western, in it's tone, language, and themes. Instead of six-shooter's however, we get knives and swords. When it comes to the sources that Joe drew inspiration from, I think it's rather apparent. Deadwood, Unforgiven, The Wild Bunch, and every spaghetti Western by Leone can all be seen as influences, as it was definitely these gritty, violent outings that gave the most inspiration. There are carriage chases, battles with savages, crime-ridden frontier towns, an abundance of outlaw scum, double-crosses, a duel with a description that would make it feel at home in any Leone film, and characters that ride off into the sunset. All together, that makes this book about as Western as Western gets. The book's plot is pretty straightforward: Shy and Lamb have their family stolen, so set across the country to retrieve them, gaining allies and enemies along the way. Cosca and his mercenary company are also traipsing across the land, employed by the Inquisition to hunt down rebels. Mix this dubious job with a mercenary's lust for treasure, and it's not hard to imagine the trouble that follows these men. This is a book where even the "good folk" are scoundrels, so a reader who desires an innocent and righteous protagonist is sure to be disappointed. Fans of Abercrombie's previous works should scoop this up immediately. Fans of both fantasy and Westerns might find a lot to love here, although it's vastly more rewarding to read all of his books in sequence as opposed to jumping in this late in the game. Overall, this book is highly recommended, and any fan of fantasy who has not already done so, should put down the book they're reading now, go to the bookstore, and scoop up every Abercrombie title. You can thank me later. I should probably start by saying that Laird Barron is a favorite around these parts. His name alone is enough to sell me on an entire anthology. Barron writes visceral, hard boiled horror. There is a smokey-noir feel to several of his stories, and quite a few feature tough, whiskey swigging protagonists. The dread he manages to cultivate is the kind of dread that sticks with one long after reading. Shadows will take on even more ominous overtones, and sleep will not come easy. Several of his works riff on the cosmic horror of Lovecraft, or the horrors of Pagan gods and deep, dark woods a la Machen. 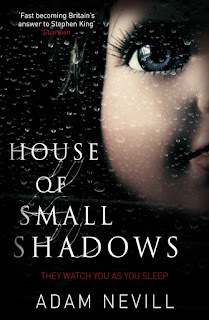 The more he writes the more he experiments with other sub-genres of horror, and he has not once penned a story that has not made it onto my list of favorites. With all that being said, he has a new story over at The Nightmare Magazine. It's a gloomy, grisly take on the major folklore concept of The Wild Hunt.If you're unfamiliar with Barron, this free story might be a good place to start. For those already familiar with Barron, it is interesting to see a story that seems much more autobiographical than most of his others. Good news to be had for fans of supernatural horror. British author Adam Nevill (Banquet for the Damned, Apartment 16, The Ritual, and Last Days) has recently signed a new book deal with Pan McMillian. I grew up with younger sisters, and I must say, I’ve always found dolls to be creepy. In Nevill’s capable hands I’m sure they will become terrifying. Also, the May publication date is for the UK version of the novel, so the US released will most likely be a few months later (all of my copies are for the UK editions – I simply couldn’t wait for the US release for any of them). Julie Crisp, Editorial Director at Pan Macmillan, has concluded a world rights deal for two further horror novels by British author Adam Nevill with agent John Jarrold. The deal also involves re-publication of Adam’s first novel, BANQUET FOR THE DAMNED, as a Pan paperback. The new books will be published in 2014 and 2015. I’ve read all of Mr. Nevill’s novels, and overall I was more than pleased, although they were not perfect. A Banquet for the Damned was mostly a solid debut novel, but there were times it dragged out and the main characters could have used a bit more work. However, it offers enough creepiness to make it worth reading, even if it is his weakest work. Apartment 16 suffered from some character flaws (the main female character wasn’t really developed at all) but overall offered an original, creepy tale of an apartment building where something is terribly wrong. There were truly several frightening moments throughout the novel. In The Ritual Nevill takes us to new territory, the Scandinavian wilderness, in a tale of two distinct halves. 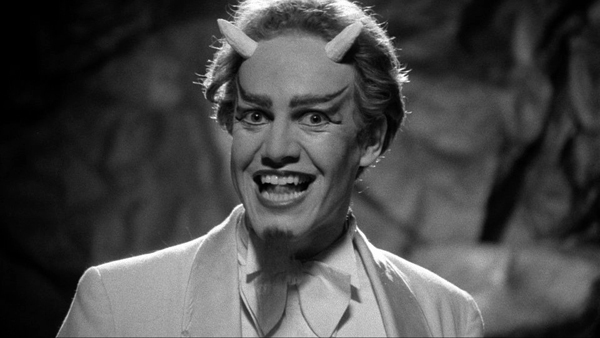 Nevill’s character work has greatly improved, and what begins as a creature feature becomes something much more. The second half is probably longer than it should be, but it could very well be his best book to date. His latest novel, Last Days, follows a small film crew as they make a documentary on a creepy cult that had met a bloody end. Of course, the bloody end was not really an end at all, and the horrors ensue. Nevill is definitely a talented, young horror author. He also seems to improve with every novel he’s written, which makes me that much more eager for his next book. If you are a fan of supernatural horror, and you have not read any of his novels, then you are truly missing out. 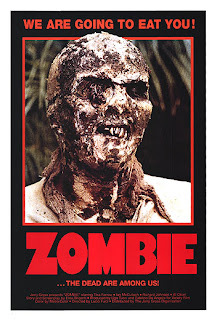 Zombie, known as Zombi 2 overseas, was the film which revitalized Lucio Fulci’s floundering career, and was the first film on his pathway to being dubbed “The Godfather of Gore”. It should be noted that George Romero’s Dawn of the Dead was released in Europe under the title Zombi, and although Fulci’s film is billed as Zombi 2, it is in no way related to Romero’s series, being simply a marketing ploy. Zombie opens with a bang (literally), as the opening scene features a corpse tied and wrapped in a sheet starting to rise from a cot until it is stopped with a bullet in the head. The mysterious gunman, who is hiding in the shadows, then states that the boat may now leave. This leads to the title credits, and another scene in which the boat is seen entering New York with no visible crew on board, and upon investigation it is revealed that a zombie is stowed away. Although the film has an exciting opening, the film does slow down for a short period, as we meet the main characters: a British journalist, the daughter of a scientist from the island, an American couple on vacation, and a doctor doing research on the island. Something is very obviously wrong on the island, as zombie attacks occur more and more frequently, although it is not known why. The film suffers from a weak plot, as overall not much really happens. The four protagonists travel to the island, and zombies start to attack en masse, then the survivors leave. This isn’t the only film by Fulci to suffer from plot problems (City of the Living Dead has quite a confusing, bizarre plot) but anyone watching the film is probably not doing so for the story. The characters are not really developed much either, and some of them are really quite bland. What Zombie lacks in plot, it more than makes up for in makeup and gore. Coming out only a year after Dawn of the Dead, the makeup in Zombie far, far surpasses the makeup quality in Romero’s film. The zombies in Dawn of the Dead look like regular people with blue makeup. Watching the film today, Romero’s zombies look really dated, silly, and in no way scary. The zombies in Zombie actually look like filthy, rotting corpses. They are grimy, bloody, and terrifying to behold. 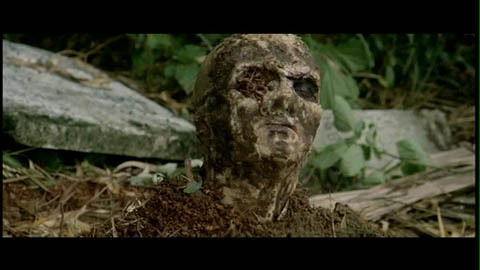 One of the more memorable scenes involved a conquistador zombie slowly rising from the earth with an eye full of worms. This zombie’s terrible visage has been used as the movie’s poster and subsequent DVD and Blu-Ray covers. Although the film was released over three decades ago, the look of the zombies more than holds up today, which I found to be quite impressive. The gore in Zombie is unbelievable. Throats are ripped out, zombie skin is ripped off, splinters enter eyeballs, heads explode, and a zombie arm is torn off by a shark. The gore often looks realistic compared to the oftentimes bright, paint-like blood of Dawn of the Dead. Blood in this film looks like blood is supposed to. The scene where a group of zombies is found eating a body is one of the best “zombie feasting” scenes in cinema. Being a zombie film, gore is a must-have, and if the merits of a good zombie movie are measured on gore alone, then Zombie would definitely be a contender for the number one spot. It is pretty clear what Fulci intended this movie to focus on. For gorehounds, zombie fans, and fans of Italian horror in general, this film is considered a must-see. Casual horror fans are encouraged to also give the film a try. Anyone with a weak stomach when it comes to gore, should stay far, far away, or attend the film with a “barf-bag”, as the trailer humorously suggests. Did anyone else enjoy Zombie, or was the weak plot too much of a hindrance? How would you rank this film on your list of favorite zombie movies? Comment below.